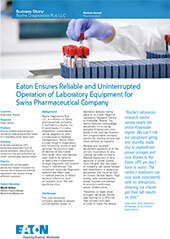 Ensure uninterrupted power to sensitive medical equipment when it is operating under heavy load. A double conversion UPS protecting equipment from all power problems, removing line noise from the grid and ensuring clean, uninterrupted power output. Reliable and uninterrupted power has helped to extend the service life of expensive medical equipment and ensure energy efficient operation. Roche Diagnostics Rus LLC is a division of Swiss pharmaceutical company F. Hoffmann-La Roche Ltd. A world leader in in-vitro diagnostics, tissue-based cancer diagnostics, and a frontrunner in diabetes management, Roche offers a broad range of diagnostics and monitoring products and services.